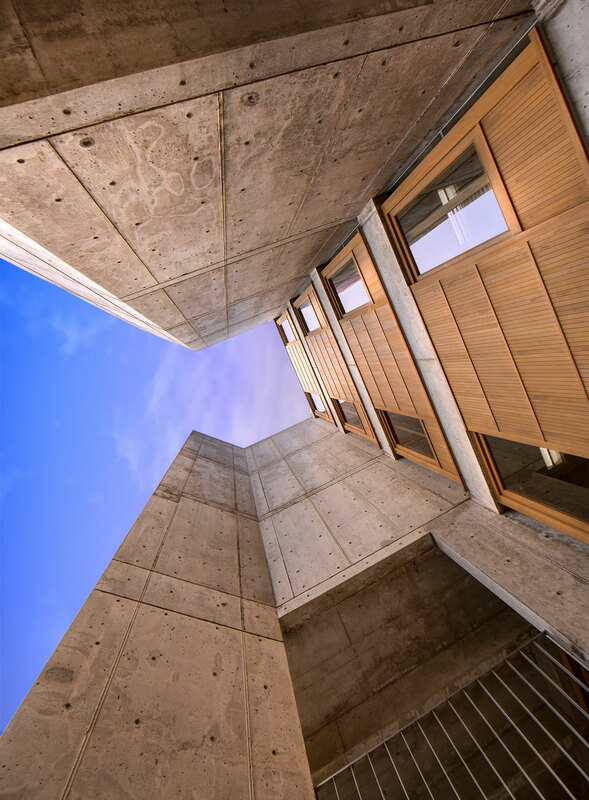 LA JOLLA-The Getty Conservation Institute (GCI) and Salk Institute for Biological Studies announced today that after four years, conservation efforts are complete for one of the key architectural elements at the Salk Institute in La Jolla, California—its teak window walls. The site, completed in 1965 and designed by famed architect Louis I. Kahn, is widely considered to be a masterpiece of modern architecture. It is also home to globally renowned scientists making breakthroughs in areas of cancer, neuroscience, metabolism, plant science, genetics, and more. Kahn was commissioned by Jonas Salk, the developer of the polio vaccine, to design the campus for his new scientific research institute on a coastal bluff in the La Jolla area of San Diego. Kahn worked closely with Salk on the design of the building, which houses offices, studies, laboratories, and other research facilities. After 50 years in an exposed marine environment, the institute’s distinct teak window walls, set within the monolithic concrete walls of the study towers and offices, had weathered to a non-uniform appearance and were deteriorated. The construction work, designed by Wiss, Janney, Elstner Associates, Inc. (WJE), addressed these issues, and Getty-led research and funding as part of the GCI’s Conserving Modern Architecture Initiative (CMAI) helped to initiate the construction. The 203 teak window walls are significant elements of the overall site, expressing a human element and scale within the monumental structure. Although prefabricated, every window has a handcrafted quality due to the detailing of the teak wood by carpenters and customization to fit many sized openings. Each offers a different combination of sliding windows, louvers and shutters, allowing staff to control light and air in their workspaces. The window walls are significant within Kahn’s larger body of work, as they expand upon his office’s language of custom exterior woodwork. Research found that the window walls suffered from surface erosion, the growth of a fungal biofilm (likely spread by nearby eucalyptus trees) that gave the wood a black appearance that varied significantly by exposure, changes to teak color due to previously applied sealers and finishes, insect infestation and moisture infiltration due to the omission of flashings and weather stripping during the original construction project and the failure of sealants. In order to understand the causes of the problems, the GCI and its consultants engaged in historical research, explored the extent of damage to the window walls, and performed physical and laboratory analysis to identify materials used and various causes of damage and deterioration. Possible treatments for the wood and wood replacement options were also researched, as well as design modifications to improve the overall performance of the assemblies. Finally, the GCI and WJE developed a series of on-site trial mock-ups to evaluate different repair approaches and treatments to identify the most appropriate ways to move forward. Drawing upon the results of the project team’s earlier research and the trial mock-ups, WJE developed comprehensive construction documents to implement the repair and conservation of the window walls, with interventions ranging from minor (cleaning and repair), to moderate (cleaning, repair, and some replacement of materials), to major (removal of the entire window assembly where severely deteriorated and replacement using like-for-like materials). WJE, with consultants Peter Inskip + Peter Jenkins Architects (I+J), also recently completed a comprehensive conservation management plan for long-term care of the institute’s buildings and site, funded by a grant from the Getty Foundation’s Keeping It Modern initiative.